The aim of the current study was to investigate the influence of happy and sad mood on facial muscular reactions to emotional facial expressions. Following film clips intended to induce happy and sad mood states, participants observed faces with happy, sad, angry, and neutral expressions while their facial muscular reactions were recorded electromyografically. Results revealed that after watching the happy clip participants showed congruent facial reactions to all emotional expressions, whereas watching the sad clip led to a general reduction of facial muscular reactions. 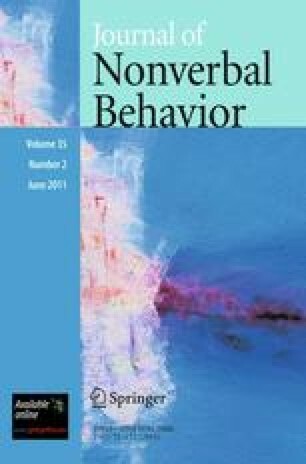 Results are discussed with respect to the information processing style underlying the lack of mimicry in a sad mood state and also with respect to the consequences for social interactions and for embodiment theories. The research was supported by the German Research Foundation (DFG WE2930/2-1) and a Postdoc-grant from the German Research Foundation (DFG) to the third author (SE 1121/3-1). Paulus, C. (2000). Der Saarbrücker Persönlichkeitsfragebogen SPF (IRI). [The Saarbrücker Personality Inventory SPF (IRI)]. [Web document]. Retrieved from http://www.uni-saarland.de/fak5/ezw/abteil/motiv/paper/SPF(IRI).pdf. Paulus, C. (2009). Der Saarbrücker Persönlichkeitsfragebogen SPF (IRI) zur Messung von Empathie: Psychometrische Evaluation der deutschen Version des Interpersonal Reactivity Index. [The Saarbrueck Personality Questionnaire on Empathy: Psychometric evaluation of the German version of the Interpersonal Reactivity Index]. [Web document]. Retrieved from http://psydok.sulb.uni-saarland.de/volltexte/2009/2363/.